Part of the Medical Marvels series for high school readers, Gene Therapy covers the history and development of this fascinating science, and includes the most recent information on the state of the field. 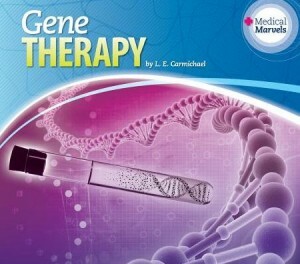 I first learned about gene therapy in a human genetics course during university – a lot’s changed since then. I got so interested in the research that I had to remind myself to stop reading and start writing. My favorite part of this book is the story about the spinning dogs. It’s in Chapter 1! "This book fills an unmet need for information on the topic appropriate for serious young readers... Readers will find this book to be clear and up-to-date. Many ethical issues are discussed, making this an ideal book for the classroom as well as a library... an excellent springboard for a research papers, and many additional resources are listed at the back of the book." "The book gives a bias-free view on both the triumphs as well as the failures of this process and leaves it up to the reader to make their own opinion... It is logical, sequential and easy to understand. It is clear that the author understands this topic and has therefore been able to write in manner that makes sense... In my experience, teaching students about the basics of genetics and then its applications in biotechnology has always been a challenge. The author however seems to do in it in an effortless way... I can see myself reading the case studies to my students to pique their interest."